Please Try - Select "Or continue to website" located below "Get the app"
Then select "Direct Download" and then select open file. We suggest using web browser by Chrome, Acrobat etc to print the PDF Files, as no issues have been reported. Enrol through AlcoDrugLimit ® for Your Initial or Re accreditation course by Downloading and returning completed enrolment form for each student, they will require an U.S.I, (Unique Student Identifying) Australia wide. 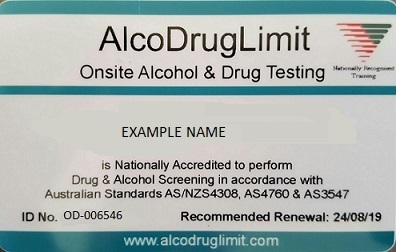 AlcoDrugLimit® is an approved retailer for products supplied by RTO - Onsite Diagnostics Pty Ltd. Registered Training Organization number 91700. Internet access is required - study at home or workplace - please read the Distance Learning Options on Page 3 Student Enrolment form. AlcoDrugLimit® have an agreement with Onsite Diagnostics pty ltd to provide customers with competitive prices without compromising service and quality. In general AlcoDrugLimit offer better than RRP, saving you $$$. An Example I.D Card, Students receive once they achieve their Statement of Attainment. In accordance with OH&S requirements all drug & alcohol testing officers are required to hold a Statement of Attainment in accordance with the Australian Quality Training Framework under the definition of 'Collector' in the relevant Australian Standards. The unit HLTPAT005 Collect specimens for drugs of abuse testing' is a comprehensive pathology based training course provided in laymans terms, available via both distance/online learning or via classroom training. What Employment Pathways are available? Employment pathways include working where the need for drug and alcohol screening has been identified as a Workplace Health and Safety requirement e.g safety sensitive industries, like mining, aviation, road transport, railways, passenger transport etc. It is also a qualification for person conducting Pre Employment Drug & Alcohol Testing services. Where is the training conducted? In order to allow flexibility and convenience for work-places and their employees we offer this course via distance learning. Support during training - Students will have access to a qualified drug & alcohol testing officer/assessor over the phone who will assist you with any questions you have during your training. A comprehensive training pack will be sent to you which includes drug testing equipment, student workbook and access to our online training portal. What are the course fees and duration? Fees: Distance Learning - Through AlcoDrugLimit® Initial issue $595 per student and $395 per student for Re accreditation course. Classroom Training - may be your preferred option, please contact us for a quote, normally requires minimum of 10 persons at your workplace to enroll. On completion of the course - participants will be issued with a 'Statement of Attainment' allowing them to work as Nationally Accredited drug & alcohol screening officers in a workplace environment. Re Accreditation Course is also available through AlcoDrugLimit at a very good price, Re Accreditation is required after two years. Contact AlcoDrugLimit Phone:: 0401 086 352 OR 0419 769 252, Email sales@alcodruglimit.com. HLTPAT005 is the Industry Standard drug and alcohol testing course and is a premium level course in the drug and alcohol testing industry - beware of courses that are not prepared in line with this industry standard training unit as they are not necessarily up to date, not pathology based and may not provide you with the materials and information to gain a comprehensive understanding of drug & alcohol testing procedures. Payment Methods - AlcoDrugLimit - You are welcome to purchase from our online shop payment with PayPal or a direct deposit to AlcoDrugLimit's bank account. Once we receive your enrollment form and payment your training pack and student handbook will be sent to your mailing address and the details for you to access the online component of the course emailed to you. Ensure to fill out the form carefully and ensure to include your USI number and Select the applicable - Distance learning option 1 or 2 on Page 3 of the enrolment form. In most cases Distance Learning Option # 2 applies. Step 2. Payment Options: Full payment for either course is required prior to the training pack being posted out. B) You may prefer to send an email to AlcoDrugLimit®, asking for an invoice and email to AlcoDrugLimit your enrolment form due to several recent sales from the online shop encountering delays with money transfer using PayPal. You can then pay using Mastercard, VISA, or Direct bank deposit. Please contact Via email if you require more information. AlcoDrugLimit® Support your future requirements of supplies and products to carry out your Drug and Alcohol testing requirements within Australia at competitive rates. If you have problems using the PDF links at top of this page. Please Send an Email using the form below asking us to email Your Student Enrollment PDF, Distance Learning Options, Course Information page to you.